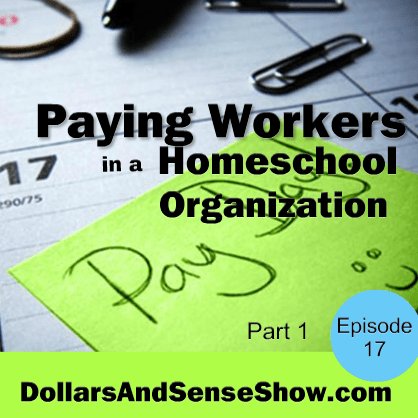 Do you pay workers in your homeschool organization? Are they employees or independent contractors? Do you know the difference? Homeschool CPA, Carol Topp, will share the details of what you need to know about paying workers in a homeschool organization in this 30 minute podcast. Part 1 of a 2 part series. 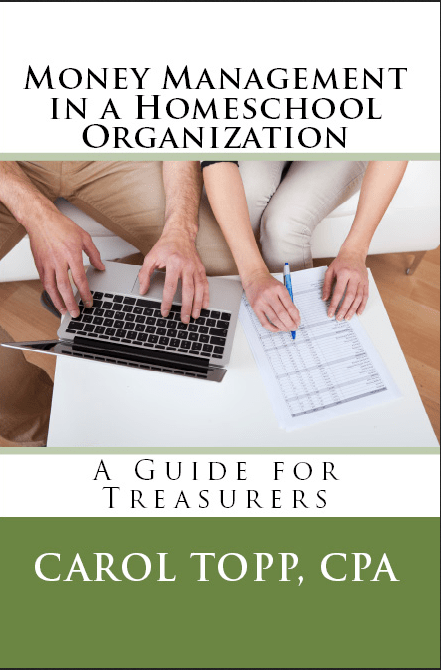 Money Management in a Homeschool Organization (newly expanded) in paperback or ebook. The Paying Workers ebook is incorporated as a chapter in this book, so you don’t need to purchase both. Be sure to listen to the second part of this podcast when Carol shares what forms you need to be filing with the IRS when you pay workers. 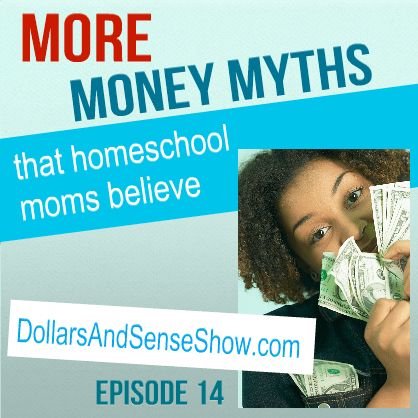 In this episode of the Dollars and Sense Show host Carol Topp and her guest Susan Raber of AtHomeAndSchool.com discuss more money myths that homeschool moms believe. On today’s show, Carol And Susan discuss two more money myths. A study of 220 families spend between $300 and $1,000 per family each year. Private schools cost from $3,000-$10,000 year. That’s expensive! Truth: Homeschooling is time consuming. “Opportunity cost” is the cost of passing up a choice when making a decision. Money tip: Make up a homeschool budget. Include books, field trips, classes, magazine subscriptions. Where is it going to go? Make sure you have a clearly designated space otherwise it increases your clutter. We hope you’ve enjoyed these Five Money Myths and remember them as we enter the homeschool convention shopping season! Tune in for the next Dollars and Sense show on April 24, 2014 when Carol will start a series on tips for teenagers or parents wanting to start a micro business. 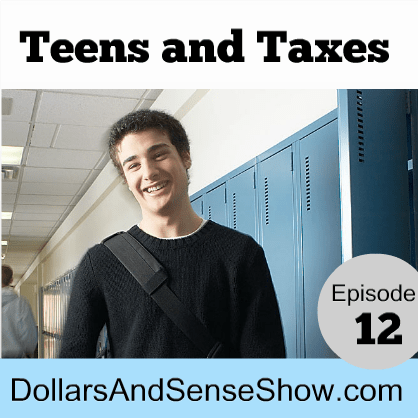 In this episode of the Dollars and Sense Show host Carol Topp discusses taxes and teenagers. A teenager files their own tax return! Do NOT add your child’s income to your tax return. You can still claim your teenager as your dependent. They check a box stating they are claimed as a dependent on your tax return. Major taxes affecting teenagers: earned income, unearned income, and self-employment tax. Example: $5,000 profit earned by single teenager. Income tax $0. SE tax $706! If you’d like to see this changed, visit MicroBusinessForTeens.com/eliminate-tax-on-teen-entrepreneurs for a position paper you can share with your congressman. Teenagers scammed: Treated as independent contractor instead of employee. Signs: Paycheck with no SS/Medicare withheld. Paid in cash. 1099MISC not W-2. Action: Complain to employer. File complaint with IRS (Form SS-8) and Form 8919 to pay half SS/Medicare. 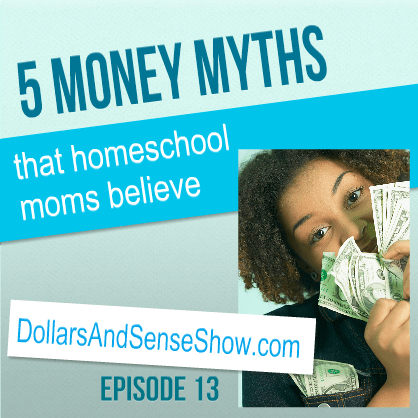 Tune in for the next Dollars and Sense show on March 27, 2014 when Carol will discuss 5 Money Myths that homeschool moms believe. 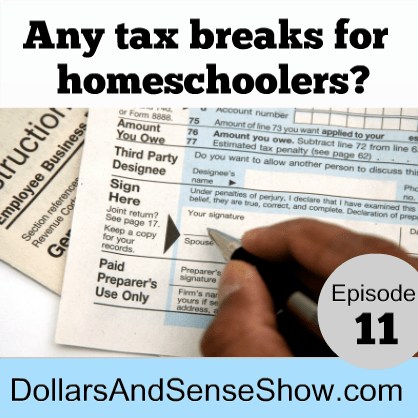 In this episode of the Dollars and Sense Show host Carol Topp discusses tax breaks for homeschoolers. Arizona, Illinois, Indiana, Iowa, Louisiana and Minnesota and all have some sort of tax break for individuals. The credit is available to any public or private school student, so it is not unique to homeschoolers. Fear of government regulation, proof of homeschooling, etc. Remember tax deductions and credits just reduce the tax you pay. Exemptions: $3,900 per person in 2013. There is a bill in the US House of Representatives to allow home school parents to take this deduction. HR 1850 sponsored by Rep Tom Cole, R-OK.
American Opportunity Credit (used to be called the Hope Credit) up to $2,500 per student. Tuition, books and equipment. First 4 years of undergraduate college. Lifetime Learning Credit: up to $2,000 per tax return. Tuition, books and equipment. Undergrad, graduate and courses to acquire or improve job skills. Tuition/fees deduction: Up to $4,000. Cannot claim tuition deduction and AOC/Lifetime for same student in same year. Student loan interest deduction. $2,500 deduction. 529 plans offered in many states. Known an Qualified Tuition Programs (QTP). Tax free earnings when used for tuition, books, room and board. Coverdell Education Saving Account (also known as Education IRA). $2,000 contribution per beneficiary per year. Tax free earnings when used for tuition, books, room and board. Can also be used for k-12 expenses. In this episode of the Dollars and Sense Show host Carol Topp discusses teaching your teenagers about money. Other people’s bad examples are all around us, including the US government. Avoid excessive debt. College debt now exceeds credit card debt. Natural style. As you go about your day. Real life examples. What things cost and what jobs earn. Career exploration. Post high school education. Budgets. One teenager is given $150/month in allowance, but she has to buy everything: clothes and gas. Student loan debt. With her dad out of work, a college student chose a state school when show the debt she would have. Entrepreneurship. Micro Business for Teens. Ethan pays his own cell phone bill. Linnea pays her way to China. Tune in for the next Dollars and Sense show on February 27, 2014 when I will discuss tax breaks for homeschoolers. 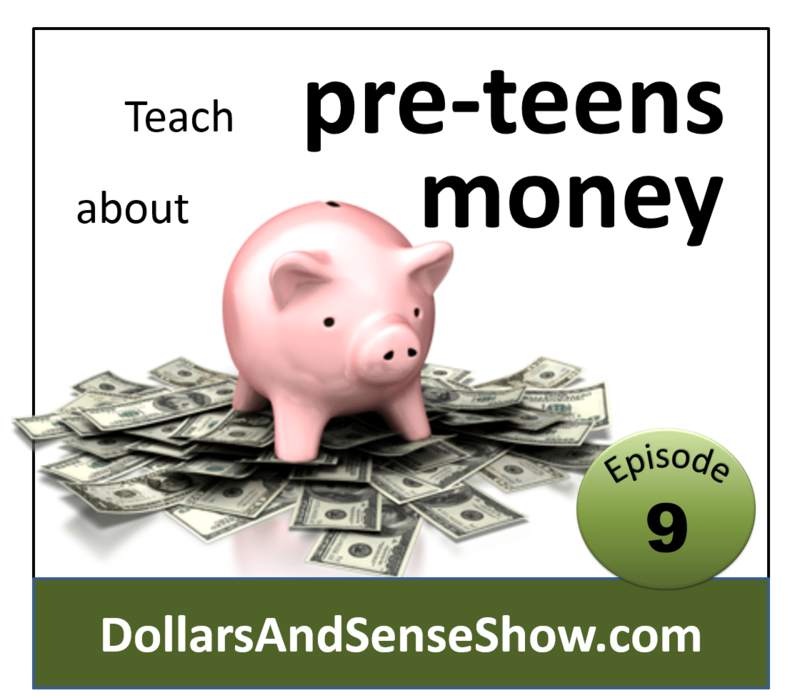 In this episode of the Dollars and Sense Show host Carol Topp discusses teaching your pre-teens about money. Savings Account. Power of compound interest. Match their savings. What things cost. Houses, cars, pets, clothes, etc. Explain sales tax. I’m not familiar with these games, so if you have an opinion for or against, please drop a note in the comments. 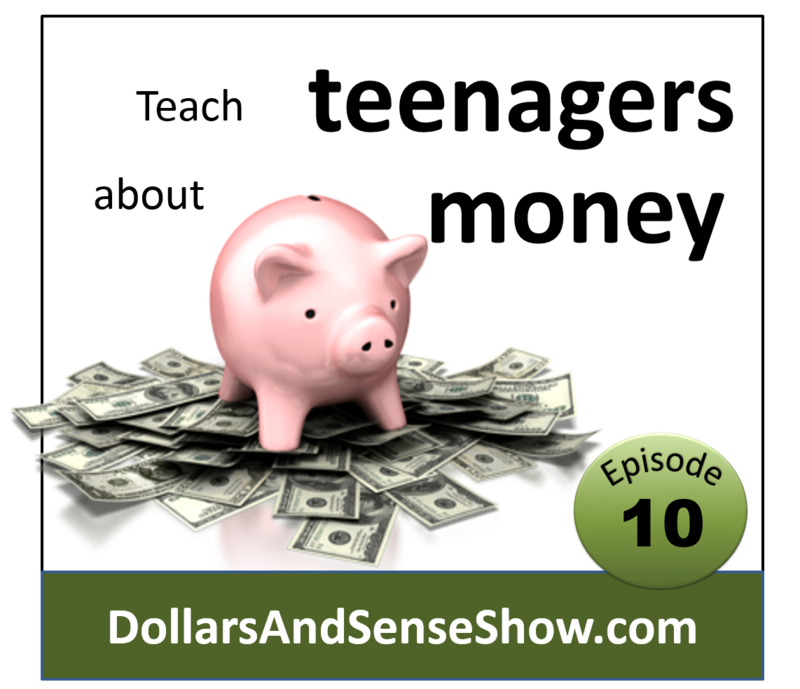 Tune in for the next Dollars and Sense show on February 13, 2014 when I will discuss teaching your teenager about managing money. Deut 6:6-7enThese commandments that I give you today are to be upon your hearts. Impress them on your children. Talk about them when you sit at home and when you walk along the road, when you lie down and when you get up. Money is limited. They must make choices. Plan ahead. Create a shopping list. Plan a dinner. Start an allowance. Have them save for a goal. Tune in for the next Dollars and Sense show on January 30, 2014 when Carol will discuss teaching your pre-teens about managing money. Other people’s bad examples are all around us, including the US government. Use testimonies. Listen to Dave Ramsey’s radio show for examples of financial mistakes and how to correct them. Don’t do for children what they can do on their own. 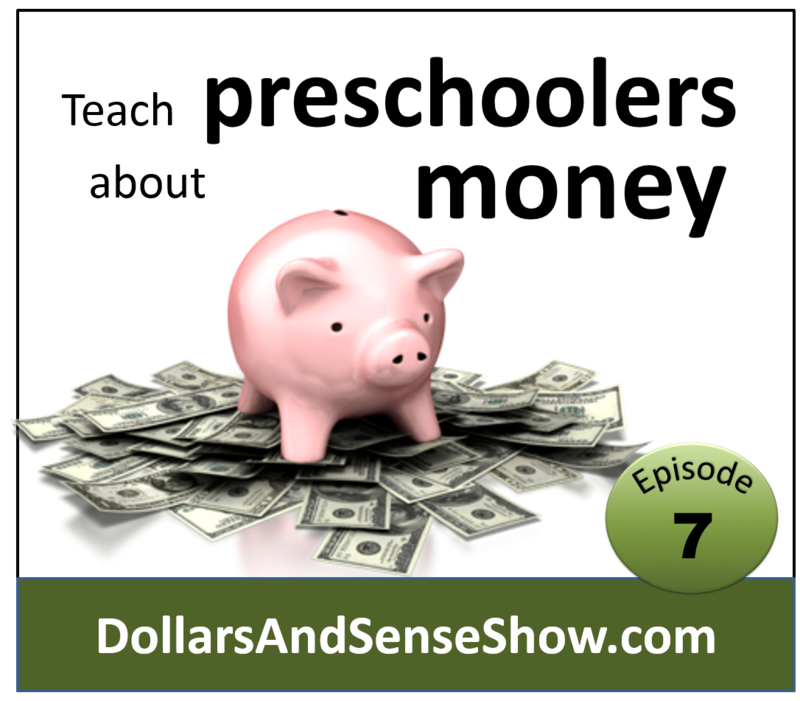 Tune in for the next Dollars and Sense show on January 16, 2014 when Carol will discuss teaching your elementary-age kids about managing money. 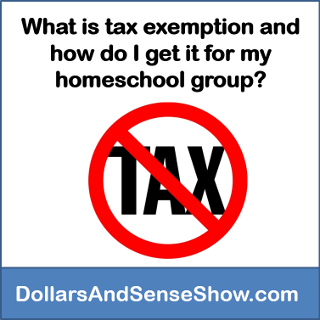 What is tax exemption and how do I get it for my homeschool group? In this episode, Carol discusses who is eligible for tax exemption (you might be surprised! ), the benefits of tax exempt status and the disadvantages. 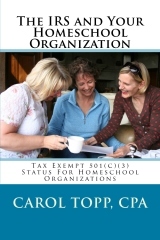 Your homeschool group may be a nonprofit and not know it! What makes your group a nonprofit? nonprofit incorporation in your state. Regular reporting to the IRS and your state. Tune in for the next Dollars and Sense show on January 2, 2014 when Carol will start a four part series on teaching your kids about money.